Anatomy-of-the-Equine is a comprehensive guide to structures of the horse. The horse is a complex, intriguing animal. Anatomy-of-the-Equine is the unraveling of this complexity, a quest to understand the horse from the ground up. As hoof care providers, we have sought to understand what diagnostic tools do not show. For instance, why does the external hoof not always reflect the soundness of the horse? A comprehensive understanding of what is deep inside the hoof is critical. Without it, we are often only making assumptions. To help farriers, veterinarians and informed horse owners, we created a bridge between "book" anatomy and the living breathing horse. By using a variety of modalities to learn the anatomy of horses including carefully dissecting, diligently photographing and then identifying all of the structures; this allows us to visualize and understand the inter- relationship between the structures. We welcome sharing our photographic journeys and collaborating with other professionals providing photos for scientific journals, veterinary lectures, textbooks and more. The Anatomy-of-the-Equine photos unravel some of the mystery of lameness, injuries and day-to-day care. We look forward to collaborating with professionals in every field. Please see the links below for more in-depth information and additional resources that Anatomy-of-the-Equine has to offer. Stay informed by subscribing to our newsletter and receive a FREE copy of our Distal Limb, Laminae & Digital Cushion eBook as a thank you! I promise to use it only to send you Anatomy of the Equine News. Buy the Dental Anatomy Guide along with the Distal Limb Guide and save $10 on the combined price and we'll give you a free copy of the Digital Pulse eBook too! Buy the Tendon & Ligament Guide along with the Distal Limb Guide and save $10 on the combined price and we'll give you a free copy of the Coffin Bone eBook too! Buy Exploring Laminitis along with the Equine Laminitis Guide and save $10 on the combined price and we'll give you a free copy of the Digital Pulse eBook too! Buy the following five books: Tendon & Ligament Guide; Distal Limb Guide; Exploring Laminitis; Equine Laminitis Guide; and Dental Anatomy Guide and save $20 on the combined price and we'll give you a free copy of the Coffin Bone eBook ($10 value) and Digital Pulse eBook ($3 value) too! 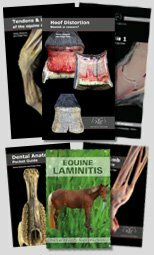 Buy all six books including the new Hoof Distortions book: Hoof Distortions; Tendon & Ligament Guide; Distal Limb Guide; Exploring Laminitis; Equine Laminitis Guide; and Dental Anatomy Guide and save $30 on the combined price and we'll give you a free copy of the Coffin Bone eBook ($10 value) and Digital Pulse eBook ($3 value) too! Buy a set of SEVEN posters and save $3 per poster. Buy the Tendon & Ligament Guide eBook along with the Distal Limb Guide eBook and save $10 on the combined price and we'll give you a free copy of the Coffin Bone eBook too! Buy Exploring Laminitis eBook along with the Equine Laminitis Guide eBook and save $10 on the combined price and we'll give you a free copy of the Digital Pulse eBook too! Buy all five eBooks: Tendon & Ligament Guide eBook; Distal Limb Guide eBook; Exploring Laminitis eBook; Equine Laminitis Guide eBook; and Dental Anatomy Guide eBook and save $20 on the combined price and we'll give you a free copy of the Coffin Bone eBook ($10 value) and Digital Pulse eBook ($3 value) too! 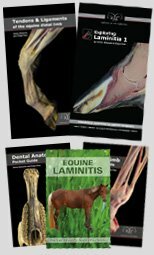 Hoof Distortions eBook; Tendon & Ligament Guide eBook; Distal Limb Guide eBook; Exploring Laminitis eBook; Equine Laminitis Guide eBook; and Dental Anatomy Guide eBook and save $30 on the combined price and we'll give you a free copy of the Coffin Bone eBook ($10 value) and Digital Pulse eBook ($3 value) too!